Dr. (TCM) April Kim comes from a long line of traditional holistic doctors and followed in the foot steps of her great grandfather, the famous Korean doctor Jonghwa Kim. April Kim practices Acupuncture, Chinese Herbal Medicine, Moxibustion and Cupping at Spire Dunedin Hospital and selected private clinics in Reading, Berkshire. Acupuncture is the ancient healing art of inserting very find needles into specific points along pathways on the body to activate the Qi (vital energy). The flow of Qi can be disrupted by many ways, i.e. emotions, poor diet, overwork, trauma, stress, etc. 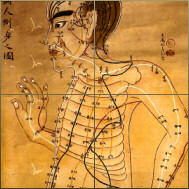 Acupuncture acts to restore the natural flow of Qi bringing a holistic balance back to the body. Acupuncture needles bear little resemblance to the needles used in injections and blood tests. They are much more finer, as well as being single-use only, sterile and disposable. Herbs are made up of leaves, stems, bark, roots or seeds. They each have a unique action. Cleverly combined together they perform a multitude of tasks and help bring a holistic balance back to the whole body. All herbs are of the highest quality and are prescribed individually to meet each patient's needs.